Did we all survive Monday? I felt like I was dragging a bit yesterday, maybe it was because of my busy weekend! This week for my Pin Challenges I decided to go back to the archives and dig up some Pin recipes I made a while back, I don't want those amazing recipes to get lost in the black hole! But before we get into those I thought we could recap last weeks recipes! I already told you how amazing these Quinoa Black Bean Burgers were! Seriously, you have to make them! I ate them on a bun, wrapped them in a tortilla and even topped a salad with these tasty burgers! I subbed in a chilly garlic sauce for the mustard! But I am not kidding, you need to make these tonight! And secondly these delicious Chickpea Tacos! (sorry my picture was not very good)!!! Also great wrapped in a tortilla or even on chips or as a salad topper! But now lets take a look at this weeks recipes, yes we are going back to the achieve of recipes! My favorite go to dinner, bake potatoes! Not just any baked potatoes black bean stuffed baked potatoes! I remember loving all the flavor combinations in this meal! And who could forget the Sweet and Sticky Chicken! I am going to serve this with some brown rice, and roasted broccoli! And stay tuned for a yummy treat that is so easy to make, trust me you will want to make these! These all look soo good! I need to try those burgers now! I'm going to try those quinoa black bean burgers. Looks amazing! those baked potatoes look delicious! 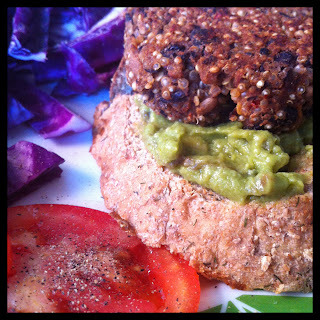 I guess I need to attempt making this quinoa burgers now that you've raved about them so much! I'm actually meal planning, for the first time in a long time, and I grocery shopped for UNDER $50. Woohoo! I got us lots of yummies too!